Visit this section of our website to stay abreast of the planning and projects related to our approved Referendum in November of 2018. It's underway! Our first team of district staff members convened for a series of meetings that will help our Administration, Plunkett Raysich Architects and Findorff plan for all of the projects related to the passed referendum in November of 2018. The Elementary Users Group met to learn more about the phases of development for the elementary building project. (A similar team will be established with similar phases for the high school and other projects as well.) 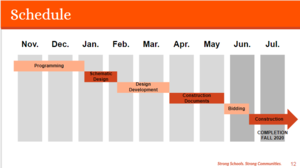 There are six design phases that will be implemented throughout the project. All timelines are estimated and subject to change. Programming (November/December 2018): Plunkett Raysich Architects gather data to plan for what spaces are necessary to meet the district's needs. They tour our schools to examine current organizational structures to understand a "day in the life" of our students and staff. User Group team members tour modern learning facilities in other districts to learn more and share their input in the design process. Schematic Design (January/February 2019): The Users Group will explore possible themes of the school. Plunkett Raysich Architects will establish conceptual floor plans. Engineers will start work on site development. Design Development (February/March 2019): Architects and Engineers will begin planning athletic fields, bus and drop off/pick up, parking, play area locations; further floor planning, finalize exterior design, interior development and the start of technical development. At the end of this phase the building footprint and wall placement should be finalized. Construction Documents (April/May 2019): Builders and architects create technical building drawings and the coordination of the building design (structural, mechanical, etc.) begins. Bidding (Early June 2019): Subcontracting and bidding processes. Construction/Construction Administration (June 2019-August 2020): Construction begins with regular meetings with Plunkett Raysich Architects, Administration and Findorff to discuss construction progress.